Well, as we all know, winter is generally not a time spent IN the garden. For many of us, however, it is a time we spend thinking about the garden. 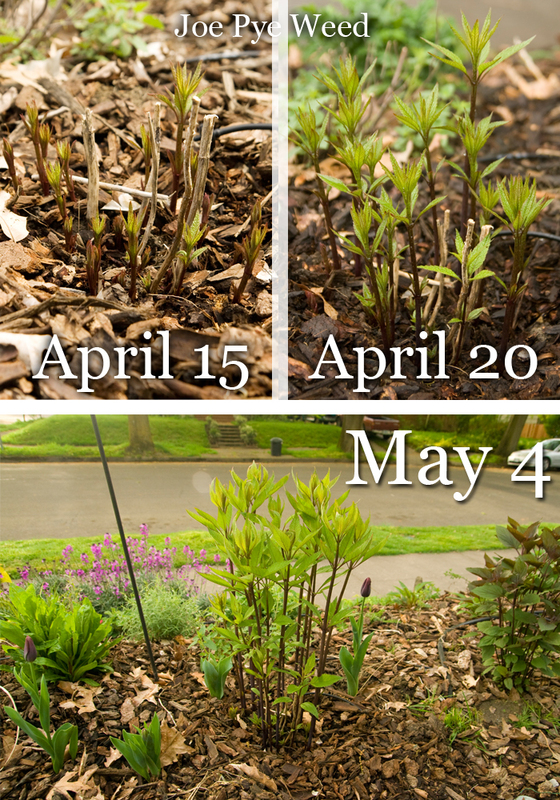 In that spirit, I've decided to do a few posts focusing on one plant and it's growth stages from the beginning of the growth season to it's death in winter. First up is my beloved Joe Pye Weed. In my garden in Zone 8, Joe Pye makes it's first appearance in late March/early April. It's easy to miss the first buds as they appear, they are a deep, wine-red color. Once above the ground, however, they grow at an astounding rate, as you can see in the pics above. By July, it stands easily as tall as me, if not taller, which means it has put on 6+ feet of growth in around 3 months. Even before flowering, Joe Pye is a beautiful and impressive plant in its own right. It's subsantial size alone give it great presence in the garden. It's straight stems have a dark wine-red coloring that really stands out amidst the deep green foliage. The leaves are arranged in whorls around the stems, making it a wonderful architectural specimen for any border. Above, you can see Joe Pye flowering with Miscanthus 'Malepartus' in the foreground. Although the Miscanthus looks taller in this pic (since I'm below both shooting upwards) Joe Pye is almost 2 full feet taller. I didn't realize it when buying the grass, but I love how its blooms echo the color of the Joe Pye. Another huge plus for Joe Pye is how big of a draw it is for bees. Honestly, it was almost comical how many bees were jostling on the flower heads for nectar. 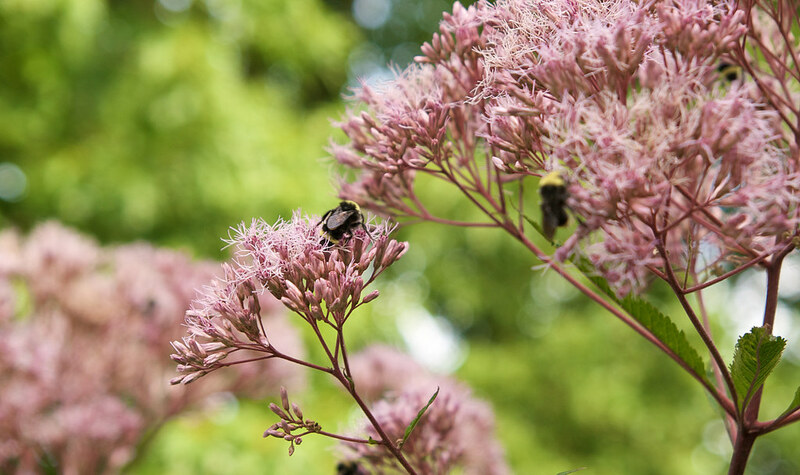 Strangely, it seemed to be mostly bumblebees on the Joe Pye Weed, while honeybees favored the nearby Sedums. Of course, fall rolled around and the Joe Pye continues to shine. 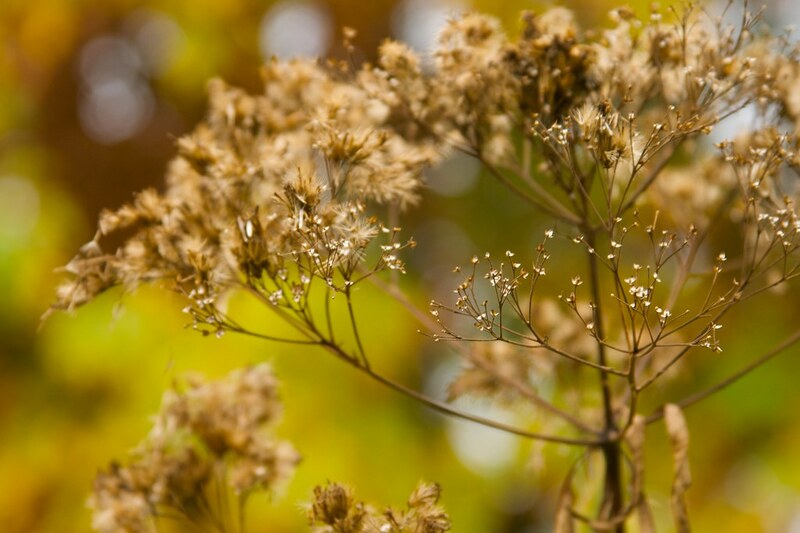 It's one of the few perennials with good, dependable, fall color. 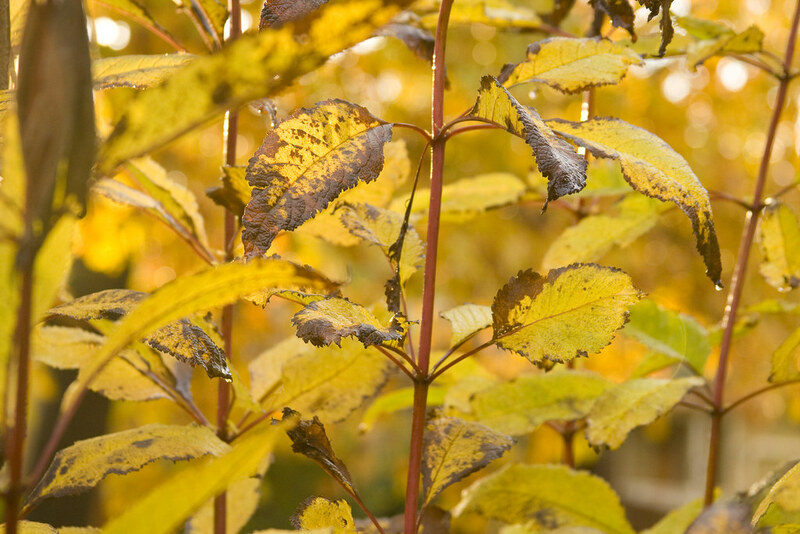 It doesn't last terribly long (maybe a few weeks), but during that time, the foliage turns a lovely buttery yellow, which contrasts quite well with the still-red stems. And of course, after frosts and rain have stripped the plant to its skeletal framework, it still remains striking. I love how the once-full and heavy flowers are now delicate and ephemeral, catching rainsdrops and dew. Joe Pye, truly a plant for all-season appeal. This is a great idea for a series posts, Scott. One of my favorite aspects of gardening with these vigorous prairie perennials/grasses is the dramatic growth habit and it's tricky to convey this sort of thing on paper, or...on a computer screen. It really is endlessly fascinating somehow to watch them respond so directly to the cycles of the seasons, isn't it? Slow motion mesmerizing. I'll second that, Peter. In our zone 6 the Joe Pye quickly turns a leaden brown-black as fall advances. Still quite dramatic, even a little spooky. Does it do that in Portland's zone 8, Scott? That is an excellent set of pictures. Love Joe Pye, I need to get me some of this really tall one. Right now I have Little Joe and Chocolate, but I need something that will make a really big statement at the back of the border. How do they hold up to wind? Hi Scott! Thanks for this excellent post! Joe Pye is one of my favorites too. Thanks for featuring the Joe Pye in all stages of growth and decay. It deserves to be used more widely and I will bump it up to the top of the list for it meets all the criteria for a low maintenence, native garden. Thanks for such a nice montage. Its always fascinating to follow a stages of a plant. Great post! I just planted some in my garden this year for the butterflies. Yours looks amazing with the grasses. Mine is with my Buddleia which is also a nice companion plant. Peter: Thanks...I've been trying to figure out something to post on in this "down" time...and figured my plants for the backyard garden would only get me so far! James: Thanks...Joe Pye definitely turns a blackish-brown for us here to once it freezes, it's very imposing and will last right up until I cut it down in spring. I love it! Alison: Thanks! They seem to be very resilient and resistant to blowing over. Mine do tend to sprawl if it's too windy when they bloom, however, the flower heads are really quite heavy. I think if they are in more sun, they are less likely to sprawl, however. Tanya: Thanks for the kind words! Fairegarden: It really does, it's such a standout plant, I think the only reason it isn't grown more often is that people are just intimidated by its size. Prashath: Thanks for stopping by! Karin: I bet they look beautiful together...the bees and butterflies must go crazy! Certainly one of my favorite plants--but I also like 'em taller than the fence, and as tall as the windows. I enjoy watching birds perch on them in winter--for some reason, they prefer these to other plants. Why? I loved this post, especially seeing more of your beautiful garden. I've only had Joe Pye weed for one year and can't wait til it looks like yours. I had no idea it looked so nice in winter, next year I won't cut it back. Very impressive! I also love the burgundy stems and its cottage-feel. Quite charming. I love Joe Pye. I can't make myself call it a weed. Je te présente mes meilleurs voeux ! 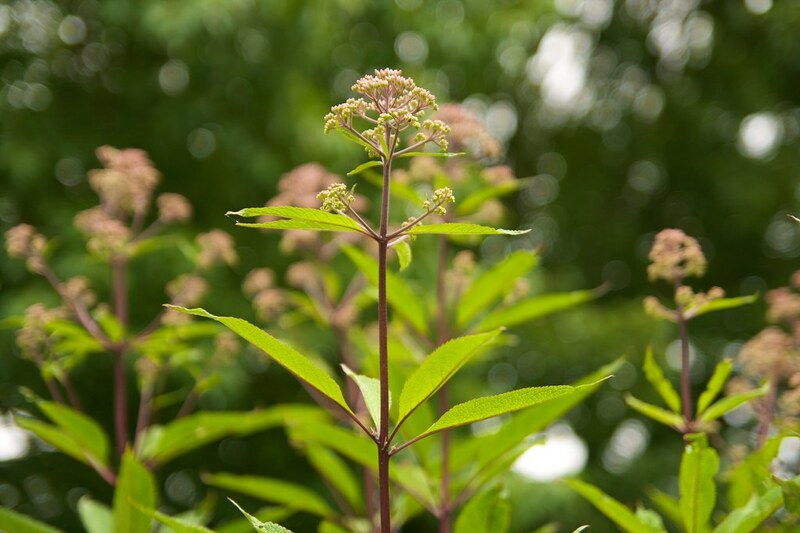 Joe Pye Weed is one of those plants I have been wanting to put in the garden. After seeing yours, I will definitely have to plant some this year. Have a Happy New Year, Scott. Joe pye is native to the eastern US and much-loved here in PA. Fun to see its growth unfold. The insect thing isn't really that strange. Bumblebees and joe pye are native; honeybees and sedum aren't. A most interesting and observant post Scott. I am tempted to do something similar - I was looking at the blackened leaves of brunnera in my garden today and trying to recall its beauty. That grass was a really inspired choice - you must be delighted. What a difference a couple of zones make! I'm in zone 5.7843 and I don't see a peep of Joe until late June. I too like the combo of Joe with the grass. One of my favorite perennials. You did its life justice. Happy New Year to you. Catherine: Thanks so much...I hope yours does well...they are such marvelous plants! 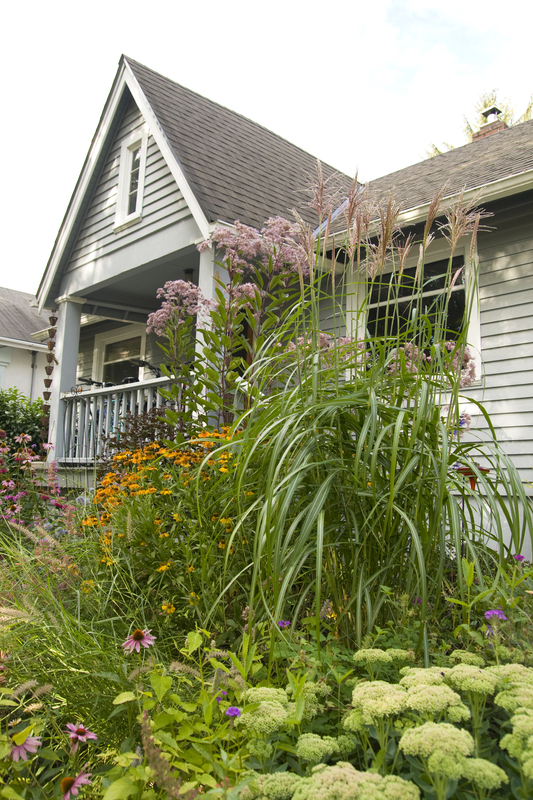 NotSoAngry: Me too...I'm ALL about the cottage-style garden! Jan: I hope you do...they are so fabulous and really easy to care for. Carolyn: That is a good point...I hadn't considered the native aspect. Anna: I hope you do, I'd love to see your post! Patty: It really does make a difference...I'm still not used to it (having lived in zone 3-4 most of my life). Tina: Thanks...Happy New Year to you too! What a fantastic idea for a series of posts! One of those "why didn't I think of that?" things. I just found your blog, but I'll be back to see what's next.